Miami Dolphins Team Tames Aggressive Bears. The fish out of water Dolphins went into the black bear infested hills of Chicago on week seven of the 2014 season. Miami's Defense tracked down and declawed the viciously aggressive Bear Offensive while Dolphin quarterback Ryan Tannehill shredded the remaining carcass. Their trophy was a giant Bear hide shaped W strapped across the hood of their plane ride home to Miami, and satisfaction of putting together an entire sixty minute TEAM EFFORT! Miami had played from behind in all previous 2014 games while declining to accept the opening kickoffs. That strategy had not been working as the opposition was scoring first with consistency and was putting the Dolphin offense in immediate desperation mode. The Dolphins won the coin flip off of Da'Bears logo, accepted the ball, and upon the first snap a groan of ""game over"" could be heard far and wide as Tannehill was sacked. Miami went three & out for 8 yards with Ryan going one for one for 10 yards on 3rd and 12, punted the ball away, and another well intended Dolphin strategy seemed to go awry. But Wait. It's a team game and the Dolphin defense had to come onto the field at some point. Chicago went three & out for 9 yards on their first possession, and gained just forty four yards on eighteen plays with zero points over the entirety of the first half. Miami defensive lineman Derrick Shelby had a sack of the Bear gunslinger Jay Cutler on 3rd and 15 during Chicago's second possession of six plays for 7 yards. Dolphin safety duo Louis Delmas had a sack, and Rashad Jones returned an interception 50 yards which ended the Bears third series of 23 yards on six plays. Da'Bears went 3 & out for five yards on their final first half possession. The Miami Dolphin Offense kept their own defense off of the field for 19 plus minutes of the 30 minute first half. For a second time in the last three games, the too often maligned Miami quarterback Ryan Tannehill completed fourteen consecutive pass attempts. On this day he started hot with his first 14 attempts being completed, (the best start of any NFL quarterback for the 2014 season)! A good for a first down and 15th successive completion was called back due to penalty. Following the initial three and out possessions of each team the Dolphins offense went to work toward their second series which totaled eighty one yards, and seven points in eight plays. The drive started with two consecutive key to the game plan quarterback keeper read options of fourteen and one yards, Tannehill followed up with passes to Clay (25 yards), Wallace (4), and Jarvis Landry for 13 yards. Lamar Miller rushed for eleven yards on the next two plays and gave the Dolphins a first and ten at the Chicago thirteen yard line. Charles Clay got wide open and caught his first TOUCHDOWN of the 2014 season for a 7 - 0 Miami Dolphin lead. On Miami's third possession Tannehill tossed the ball for 50 total yards on four of four to three different receivers (Landry for fifteen on first and ten), Daniel Thomas (8, 15), and Clay for twelve yards. The Dolphins rushed the ball five times for ten yards and Tannehill was sacked twice which forced a missed field goal attempt of 50 yards. The possession garnered only 52 net yards on twelve plays but ran 7:20 off the clock. The Dolphins fourth series started at Chicago's twenty three yard line after the previously mentioned Rashad Jones 50 yard interception return. A first and ten 15 yard pass to Brian Hartline and a Lamar Miller 3 yard run followed by a false start penalty put Miami at the Bears ten on second down. Hutt Huttt Hike, Ryan Tanne-Thrill scanned through his first three pass options, threw the ball previous to his fourth reads final cut and perfectly placed the ball into the hands of Mike Wallace for a Miami Dolphins TOUCHDOWN and 14 - 0 lead. Ryan Tannehill completed his first four passes of Miami's final first half drive of (25 yards on 8 plays) prior to his first incompletion of the game. His fifth of five attempts on the drive was completed to Lamar Miller for 22 yards to the Bears 12 but was called back due to a penalty, and (out of reasonable field goal range considering the situation). Tannehill finished the half with completions on fourteen of fifteen pass attempts for 176 yards, two touchdowns, and a Miami Dolphin lead of 14 - 0 in Chicago. Chicago took the third quarter kickoff 81 yards on 12 plays in 7 minutes to climb within 7 - 14 on a Cutler to running back Matt Forte touchdown, and the cry's of ""game over mann we're up crap creek without a paddle"" were once again billowing through the airwaves. Miami wasn't listening as their quarterback led offense responded with a march of eighty three yards on 13 plays in 7 plus minutes. Tannehill went five of six for 32 yards to five different receivers, (Miller, Sims, Hartline, Wallace, and Clay). The quarterback also executed a 30 yard run on a 4th and one read/option play from the Bears 39 yard line, Ryans 20 MPH of momentum carried two defenders over the last 10 yards. Lamar Miller rushed the ball six times for 21 yards including the drives final two plays of one carry for seven yards from the nine as well as one for a two yard Miami Dolphin TOUCHDOWN and 21 - 7 scoreboard advantage with 31 third quarter seconds remaining. Upon the Bears third play of the following series on second and twenty from Chicago's 24 yard line, Miami's star defensive end Cam Wake executed the hat trick of a sack, forced fumble, and recovery at Derr'Bears 16 yard line. The Dolphins in protecting a 14 point lead with less than a quarter of football left chose the conservative route at this point and kicked a 33 yard field goal for a 24 - 7 lead. Miami kicks off to Chicago. The Dolphin defense again rewards their offensive team mates (for keeping them off the field and fresh) with a Courtland Finnegan forced fumble upon the Bears second play which was a completion for a first down. The fumble was recovered by Miami's Randy Starks at the Chicago 35 yard line with 13:13 remaining in the fourth quarter. Miami threw the ball on their first 3 plays for 12 yards and a first down with Ryan connecting to running back Damien Williams on the first two of three pass attempts. On the next play Daniel Thomas ran for eleven yards and "another Miami Dolphin first down". Thomas carried the ball two more times for 3 net yards followed by a Tannehill incompletion/intentional grounding penalty under duress, and the Dolphins settled for a 37 yard field goal attempt that was blocked which kept the score at 24 - 7 Miami. Aided with a 39 yard pass interference call on an uncatchable ball, Chicago drove 73 yards on six plays in two minutes for a touchdown on their next possession to pull within ten points at 24 - 14. With 7:38 remaining the Dolphins ran 5:25 off the clock to go 65 yards on 12 plays for a 19 yard field goal and 27 - 14 advantage. Ryan Tannehill completed four of five for 57 yards to 3 different receivers (Wallace for 8 & 12, Dion Sims for 26, and Landry for eleven). Lamar Miller had five attempts for 16 yards which doesn't include a four yard touchdown run that was called back due to penalty. 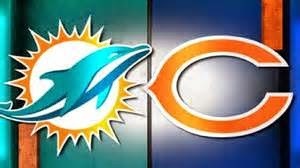 Da'Bears possessed the ball for one of the final two minutes with 10 plays for 35 yards, including two fourth down plays with the second failing, and turned the ball over on downs to The Miami Dolphins for a Victory formation final score of 27 - 14. The Dolphins had a time of possession advantage of 37:22 to 22:38. Miami accrued a net number of 393 total yards (137 rushing & 256 through the air) via 69 plays to Chicago's 224 (52 & 172) on 51 plays. Tannehill went 25 of 32 for 277 yards with two touchdowns for a quarterback rating of 93.9, and an overall grade of 123.6 along with six carries for 48 yards. Jay Cutler went 21 of 34 for 190 yards with one touchdown, one interception, a QBR of 19.3, and an overall 74.4. Lamar Miller had 18 carries for 61 yards and one logged touchdown. Matt Forte carried the ball 12 times for 49 yards and one touchdown. Charles Clay led the Dolphins in receiving yards with 58 on four catches and a touchdown while Mike Wallace led the team in receptions with five for 46 yards and a touchdown. Matt Forte (Chicago's running back) was also the Bears receiving leader with six catches for sixty yards and a touchdown while two of the leagues elite receivers in Brandon Marshall and Ashlon Jeffery combined for a total of only 57 yards on eight catches. Miami sacked Cutler three times (Delmas, Shelby, Wake), forced four fumbles (3 via Da'Bears quarterback) while recovering two overall, and had a Rashad Jones interception of the locked and loaded with heavy artillery gunslinger. Chicago sacked Tannehill four times, and forced zero Miami Dolphin turnovers.